This post is sponsored by Rustic Cuff. Amidst the hustle and bustle of school, work, holidays and everyday life, it’s easy to get caught in a bubble. Often by accident, we walk through our days focused solely on what we need to get done, how fast we need to do it, and most importantly, how we’re going to pull off an insane number of tasks in just one day. If you’ve visited Legacy West, you’ve most likely spotted the stunning Rustic Cuff showroom that debuted earlier this year. RC fanatics were already more than familiar with this unique brand through online purchases and visits to Founder Jill Donovan’s hometown of Tulsa, Oklahoma. While Rustic Cuff offers beautiful handcrafted jewelry, a step inside one of the showrooms reveals what makes this company truly sparkle. It’s a movement Jill calls “The Kindness Effect,” and its sweeping throughout her business and beyond. Jill Donovan believes in the power of random acts of kindness. In fact, she encourages her employees and even her fans to give gifts to strangers whenever they feel led. She sees each interaction as an opportunity to make a positive impact on someone else’s life. The creation of Rustic Cuff actually started out as a hobby; Jill spent many late nights crafting one-of-a-kind jewelry for friends and family. From there she branched out to her local community, handing cuffs to strangers in the grocery store and around Tulsa. Seeing the joy and hope that a simple act of kindness could spark in someone was beyond inspiring. With encouragement and support from friends, Jill decided to turn her passion into a brand that would spread The Kindness Effect far beyond her reach. After Rustic Cuff budded into a full-fledged business, Jill began sharing her gifts in other ways. She partnered up with a local news station and traveled around Tulsa chatting with strangers, often blessing them with unexpected gifts: tuition money, complimentary car repairs, surprise family reunions and more. Through this personal memoir, Jill encourages readers to follow their instincts and give whenever they feel led. You don’t have to wait until you are financially secure to give to someone else. You don’t have to wait until you have all of your own emotions in check to comfort someone else’s heart. Do the very best right where you are. Gifting doesn’t mean shelling out a large sum of money or an extravagant purchase. Each of us has a special gift to share with others. Sometimes it’s as simple as a smile or a few hours of your time. 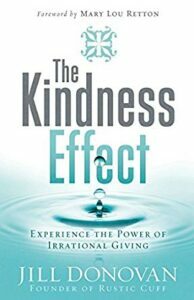 Experience the irrational giving that has inspired Jill and many others to spread kindness throughout the world. Visit Rustic Cuff online to learn more about Jill’s journey and to view their breathtaking collection of hand-crafted jewelry.